I know a red, white and blue dessert would be much more fitting, considering the upcoming holiday weekend, but waiting another week to share these with you would be ludicrous! With a capital L.
So it’s okay, go ahead and enjoy your hot dogs and hamburgers, baked beans, potato salad, coleslaw and maybe even a little festive dessert. But when you get back to your normal routine in your kitchen, you’re definitely going to want to make these bad boys. They’re packed with fiber, iron, antioxidants and protein, AND they taste incredible. So let’s talk about how easy they are to make! Because I know you guys are like me and you appreciate a healthy plant-based meal that doesn’t take seventy-two years to cook. First off, using a food processor for this recipe saves a ridiculous amount of time so I hope you’ve got one. It’s my most used kitchen appliance and I don’t know what I would do without it. To make the filling all you have to do is throw everything into that little magical bowl and pulse a few times, until it’s all mixed together and has a slightly chunky texture. Then you place the mixture on a baking sheet and cook it in the oven for 15 minutes and VOILA! Your delicious black bean pecan taco “beef” is ready to go. 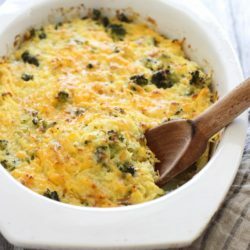 The filling isn’t really spicy, there’s just a hint from the jalapeno, but if you have little ones and you’re worried about it being too much then you can just leave it out. Now of course, any good taco has a few toppings so we can’t leave those out. Rather than using dairy cream or cheese, you can make a super healthy plant-based cream from soaked pumpkin seeds, lime juice and a pinch of salt. Again, just throw everything into the processor (or blender) and blend until smooth. It’s crazy simple and SO delicious! In addition to the lime pepita cream, I also topped them with my Chipotle-inspired corn salsa and some diced roma tomatoes. All together it made for the best taco I think I’ve ever had. They’re seriously that good! Start by preheating the oven to 400°F and then line a baking sheet with parchment paper. 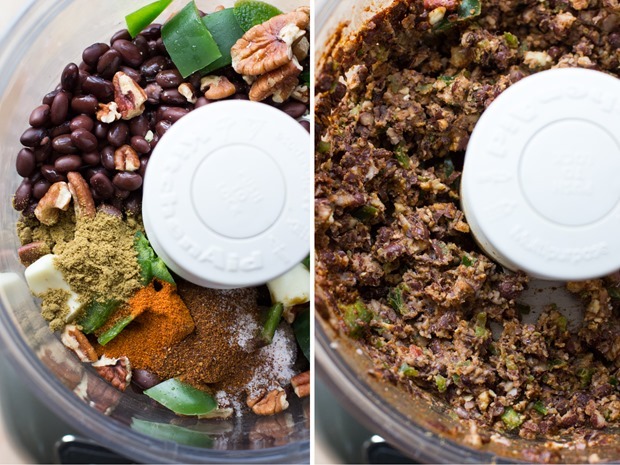 Combine all of the ingredients for the black bean pecan mixture in a food processor and pulse until ingredients are well combined and a chunky texture is achieved. Scoop the mixture out onto the baking sheet and bake in the oven for 10 minutes, stirring halfway through. Meanwhile make the pepita cream by placing all of the ingredients in a blender or food processor and blending until smooth. Add more water or lime juice to thin, as needed. 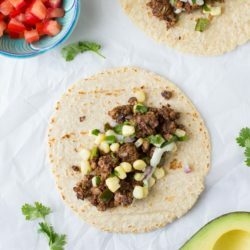 Once the taco filling is done cooking, divide it among the tortillas and top with desired toppings. Serve with lime pepita cream and enjoy! *Vegan Worcestershire is not gluten-free. You can sub tomato paste or tamari in it’s place if necessary. Leftovers can be stored in an airtight container for up to 4 days. To reheat the black bean mixture, simply microwave for 30 seconds. It reheats very quickly! 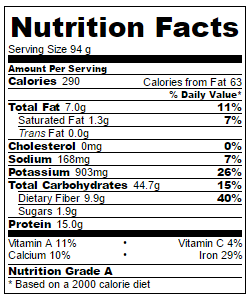 Nutrition Facts are for one taco with lime pepita cream. I’m not a vegan, but you make it look so good! Tacos sound amazing right now. 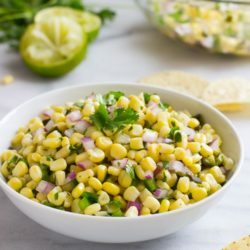 I was reading your recipe for the corn salsa to Riley yesterday and he agreed that we need to make it! I really want to try the lime pepita cream! It looks so delicious. I’ve been wanting to try this super trick veggie taco thing for sooooo long! 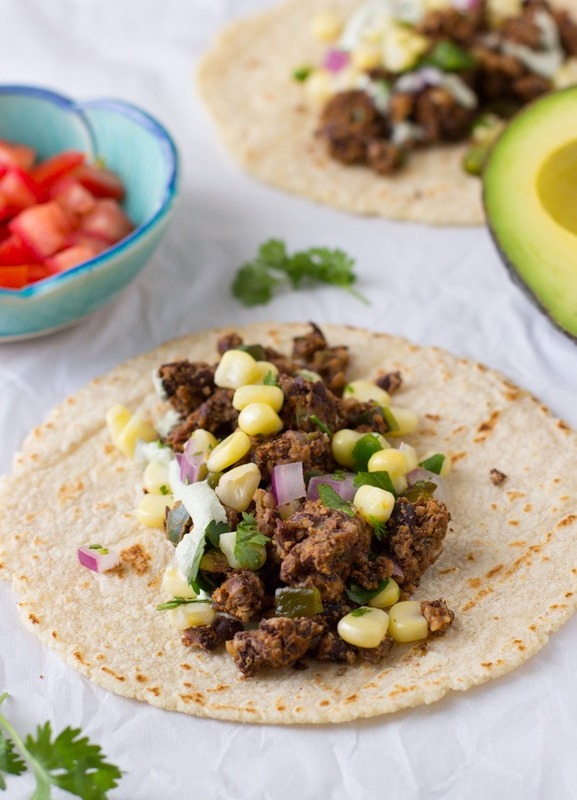 Ugh, you make meat-less tacos look like a dream! 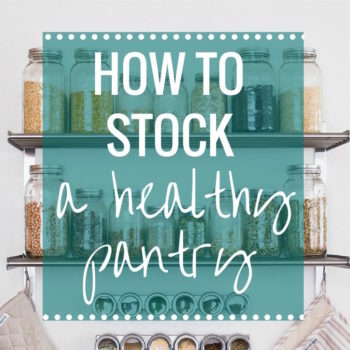 I have both walnuts and pecans here in my very own home, and always have a stock pile of black beans, so I’m thinking I’ve got no excuse. That pepita cream? I want to drink it! A food processor is by far my most used kitchen appliance. I’m speechless when people tell me they don’t own one. As for these tacos… yes, yes and yes. So good! Wow that black bean filling looks fantastic! YUM, this is my kind of taco! 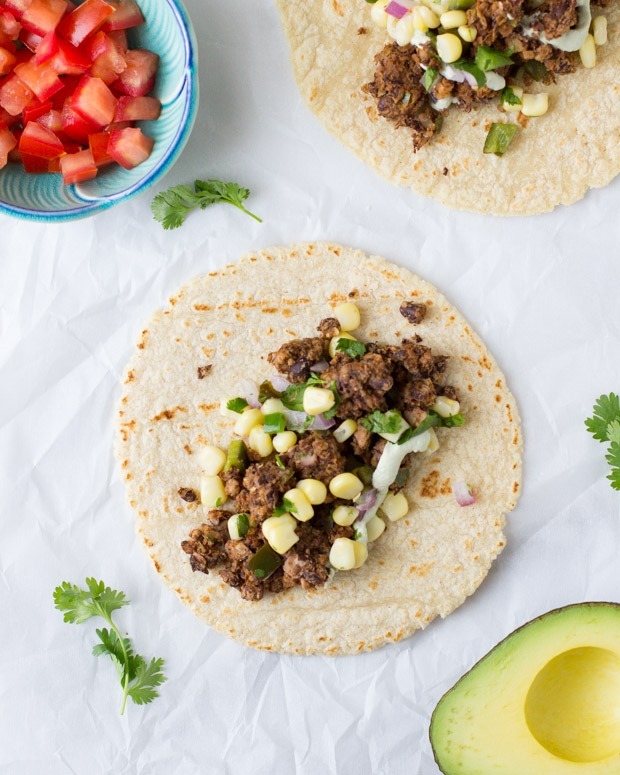 One, that taco “meat” is super super cool and two, I need that pepita cream in my life! Yay for awesome tacos! 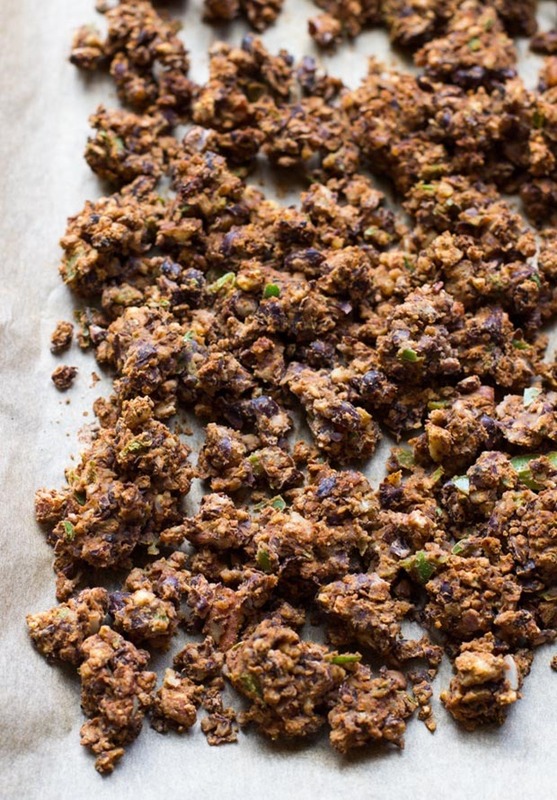 Pecans and black beans – so creative and inventive! Great mix of healthy plant-based fats and proteins. Yes to allll the vegan summery eats! This looks amazing and I was wondering where you were going when I read ‘pecan tacos’, but now I get it! So yum and love the colors :) Pinning! The amount of amazingess happening in these meatless wonders is almost too much to handle. Pecans AND beanies to make mock beef?! Sheer genius. Screw the festive desserts! These are where it’s at, girl. Beautiful, I want to make this for guests this summer. 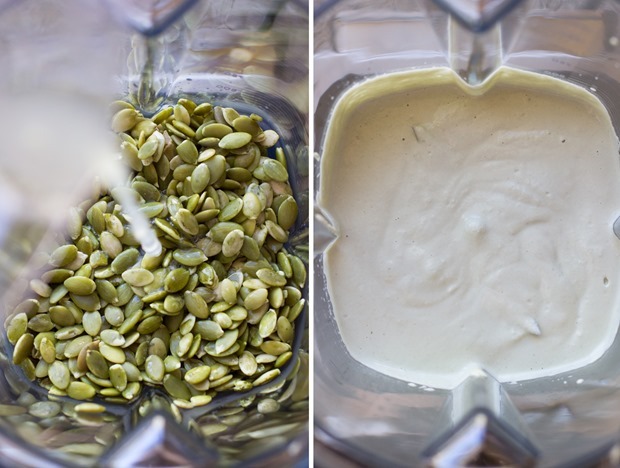 I had no idea soaked pepitas could make such a creamy sauce! 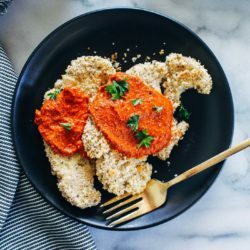 Can’t wait to try that as a nut-free substitute for cashew creams. This sounds so awesome and I can’t wait to give it a try. Thanks for all your hard work and creativity. I, for one, am very happy that you are able to devote more time for blogging. 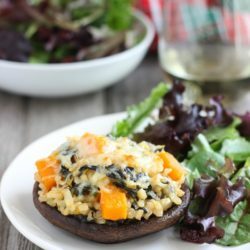 I’ve gotten some really great recipes from you. I enjoy your style of writing too. Thanks! My gosh, I am so in love with your lime pepita cream! I’ve only tried cashew cream so far, so I can’t wait to try this new nut cream! Your posts are already blowing me away! 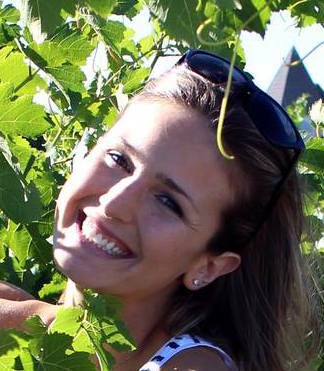 I can’t believe I haven’t been on your blog until today! 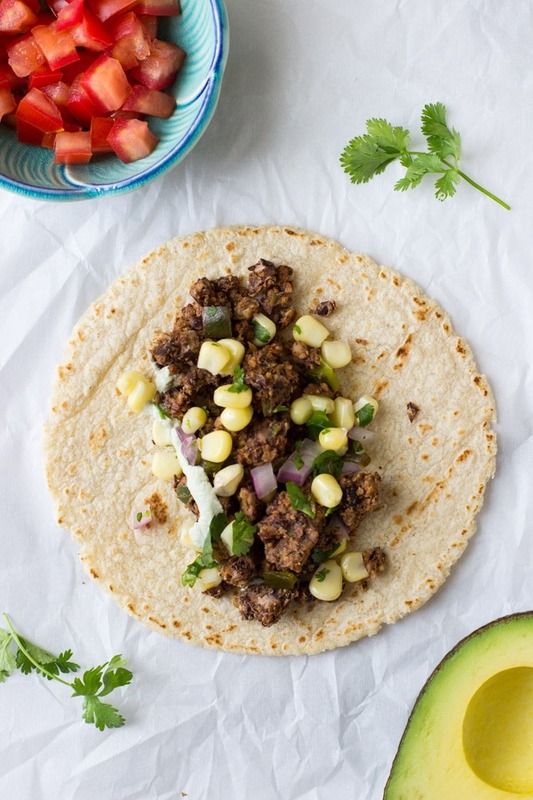 Replacing meat with beans AND pecans is pure genius. I’ll definitely be trying many of your recipes soon! Pingback: . link love 7/5 . - . running with spoons . Oh my, Sarah! 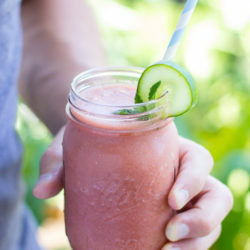 Gushing over here with this genius recipe! From the filling to the pepita cream, this recipe has all the flavors I love. Because I am a huge fan of all the flavors of Mexican food, this one I know, is a party in the mouth! Why have I not tried pepita creme? I think I’ve been so focused on cashews, I’ve ignored the humble pepitas. No more! Thank you for this, Sarah! I liked but hubby did not !!! I made avocado cilantro cream … it was so good !!!! I’m sorry to hear your husband didn’t like it but I’m glad you did! Thanks Bev!